Non-intentionally, this Keep It Real edition includes three stories on primarily quarterbacks. Just another reason why Quarterbacks date the best looking women! 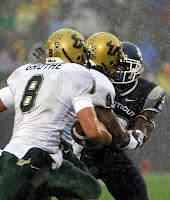 University of South Florida quarterback, Matt Grothe, thinks he and all collegiate athletes whose replica jerseys are sold for a profit, should see a piece of that pie. "All the great college players that have had thousands of their jerseys sold. The schools are making a ton of profits off it; even the places that sell them are making money. I don't understand why players shouldn't get a small percentage." Well Matt, it's time to wake up and stop devaluing your FREE education! For starters, your all going to school for NOTHING. Meals, books, housing, work out facility, tutors, transportation to and from games, equipment, training equipment (sweatshirts, t-shirts, pants), ALL paid for. Oh, and your FIRST CLASS EDUCATION which for those who don't go onto to the pros, will come in handy some day! $40,000 a year in some cases which comes out to oh I don't know $160,000 over four years, and that's not enough? What about your fellow teammates? A major college football program holds something like 100+ student athletes on their squad, if your paying 1, a piece for his jersey, the school will have to print up jerseys for all 100+ just to give them the ability to get a piece of jersey sales. If your good enough the next step on your road is going to lead to you getting paid in excess of a million dollars a year, the stage you got to perform on to get you there, cost you NOTHING! This is the same old argument, you want these schools to give the students a kick back of the giant dollars paid for making it to a big time January bowl game, these are businesses people, they are in it to make money not give money away. Finally, for guys like Matt Groethe (who holds nothing on the jersey sales that USC made off of Reggie Bush) I've been working for three years since college graduation, each month I pay a ridiculous amount of money to major banks that I took student loans from. I didn't get to go to college for free, get treated like a rock star for four years, I may have partied like a rock star, but I didn't party for free. If my college was willing to give me an education for free and all I had to do was let them sell my clothes, I'd be all for it. When Matt Groethe makes his first million are we really going to feel bad for that struggling college student?!?!?!? KEEP IT REAL! They aren't allowed to put your name on the back of the jersey, in four years, it'll be just another South Florida Bulls jersey. 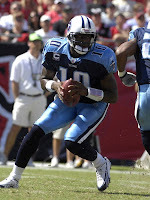 I truly feel bad for multi-millionaire Vince Young, who is getting booed by hoards of fans in Nashville, Tennessee. Wait, no I don't!!!!!!! I think Vince Young is a good quarterback, I've always thought Vince Young was a good quarterback, ON SATURDAYS! For every general manager and owner in the NFL, who is thinking about drafting Ohio State freshman, Terrelle Pryor, in a few years when he is the most talented athlete in the draft, take a look at who is starting for the Titans and Jeff Fisher this weekend, Kerry Collins. Not the 2006 third pick overall, not the quarterback who slayed the Trojans in the national championship game that same year, and not the guy who was rated ahead of current Broncos starter and Vanderbilt grad, Jay Cutler. Michael Vick & Vince Young were fun for a while, they were both on the cover of Madden, both made the Pro Bowl, and today, one is in prison and the other is not sure if pro football is for him. These guys can win a few games for a couple years, but like most things in life, their game gets old fast. Defensive coordinators get smarter, they get players who are faster, and they force that shifty quarterback into a pocket, if he can't play in that pocket, he's useless. The only guy I can think of who matured in that role was Steve Young and maybe Kordell Stewart, who turned into somewhat of a receiver SLASH (lame pun) rusher and situational quarterback. I'm not saying that Vince couldn't turn into a good quarterback, but he's going to have to learn on the job and find a way to move out of his comfort zone, that means taking hits and having a consistent target to throw to (hint: David Givens and Justin Gage aren't those guys) Cheer up Vince, millions of kids are wearing your jersey, you were on the cover of Madden, and maybe its just me, but I think that is pretty special! Keep it Real! Tom Brady gone for the season, Peyton Manning not exactly looking like Peyton Manning, and Ben Roethlisberger, well he plays in Pittsburgh, so who is the NFL's #1 quarterback? 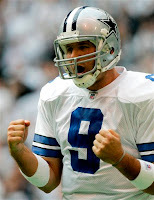 I'm not playing favorites but it's Tony Romo. Forget the great play under center, forget the megastar girlfriends, and forget the fact that he plays for the most honored franchise in major American sports, Tony Romo is just a great guy. (Bromance taking over) I've got a little story to brighten your weekend (or just make you hate the Cowboys more) , as first reported by the Fort-Worth Star, on Sunday night, after touching down in Dallas on a return flight from Cleveland, Cowboy quarterback impressed a few of the Cowboys faithful, OFF the field. While Romo was driving home from the airport he noticed two motorists stranded on the side of the road with a flat tire, (Brady would have honked and kept driving), but Romo stopped his car, assisted the couple in changing the tire and continued on his way. The couple said they watched more than 100 cars drive by and no one stopped, but this millionaire quarterback of the Dallas Cowboys thought nothing strange of stopping and helping out someone in need. Ask yourself one question, HOW 'BOUT THAT COWBOY!?!?!? !